American Wholesale Property: SOLID DEAL in the BRAYS OAKS area! SOLID DEAL in the BRAYS OAKS area! 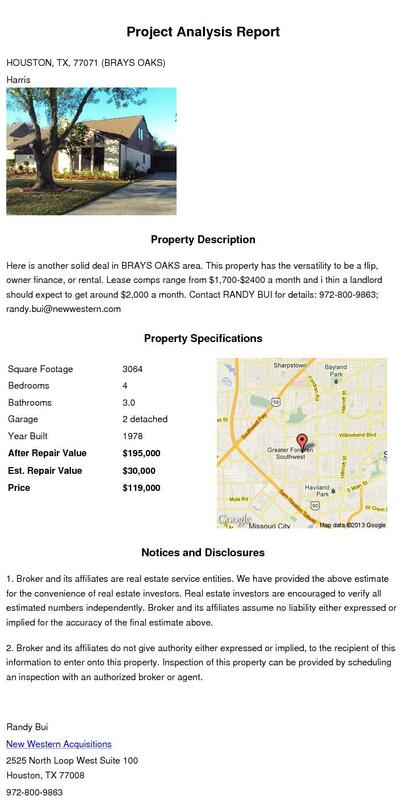 Here is another solid deal in BRAYS OAKS area. This property has the versatility to be a flip, owner finance, or rental. Lease comps range from $1,700-$2400 a month and i thin a landlord should expect to get around $2,000 a month. Contact RANDY BUI for more information; 972-800-9863; randy.bui@newwestern.com.